In late 1942 the Red Army needed a weapon, like the SU-152 self-propelled heavy howitzer, that could destroy German fortifications and quickly provide direct and indirect supporting heavy artillery firepower. Normal towed artillery guns found it difficult to keep up with the advancing Soviet Armoured brigades over the often thick snow covered frozen ground or through squelchy sticky mud. Many guns were still towed by horses. The gun crews as well as the horses, were at risk of injury from shrapnel that flew out of nearby exploding enemy high explosive HE shells. They had no armour protection. They also needed a strongly armoured powerful weapon that could be used in urban environments like at Stalingrad and Leningrad (St Petersburg), to clear houses and factories of enemy troops. This vehicle was not designed as an anti-tank gun but it became a tank killer. The designers got to work in November 1942 trying to fit a 152mm ML-20S artillery howitzer gun onto a tank chassis that was already in production. 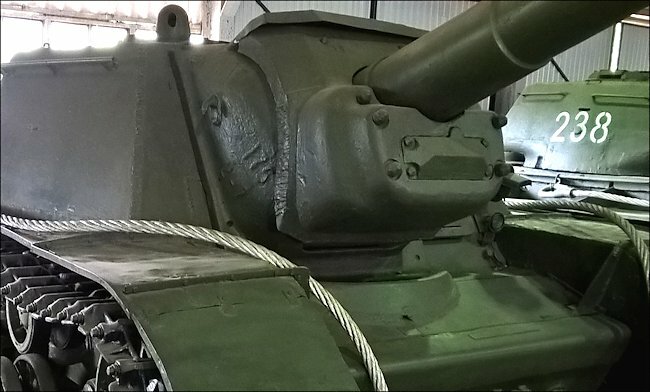 They chose the KV-1 heavy tank chasses rather than the lighter T34/76 tank as it was larger and more capable of carrying the weight of this massive 152mm gun. 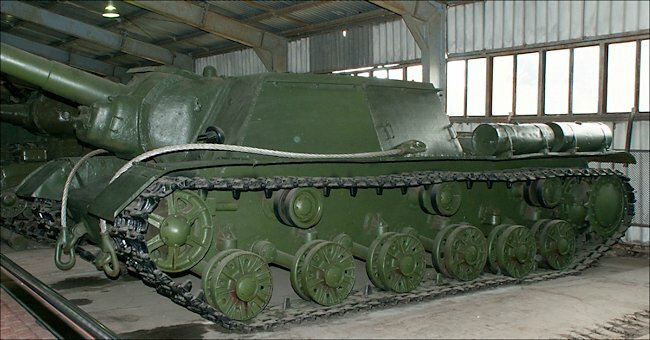 The main difference between SU-152 and later ISU-152 SPG is the tank chassis the main gun was fitted to. The SU-152 used the KV-1 tank chassis and the ISU-152 used the newer IS-1 tank chassis. 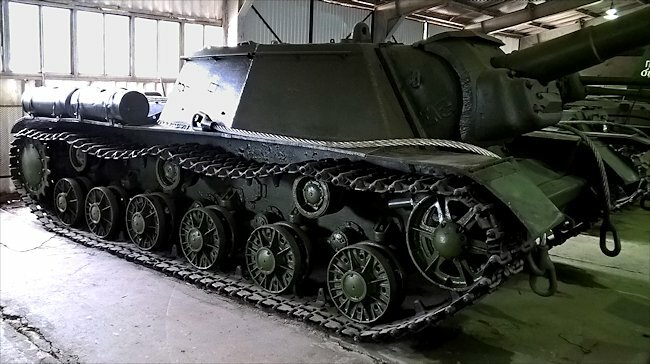 The SU-152 weighed 45.5 tones and was powered by a 12-cylinder 4-stroke diesel model V-2K engine that produced 600 bhp. It had a top road speed of 43 km/h (27mph). The front sloping armour was 75mm thick. The side armour was 60mm thick and the roof only 20 mm. One design fault was the lack of a machine gun. It was believed that the SU-152 would be used behind the front line with other tanks and supporting troops in front of it. Experience in battle found this just did not happen. The tank crews needed a weapon for close combat protection especially in urban environments. A 12.7mm DShK anti-aircraft machine gun was retro fitted on a mount on the roof to existing vehicles when they came back from the front for repair or maintenance. All new SU-152 SPG's coming off the production line after the Summer of 1943 had the machine gun fitted. The 152mm ML-20S artillery howitzer was fitted slightly to the right of centre to give room for the gunner, driver and loader on the left of the gun. The commander and breech mechanism operator were to the right of the gun. The howitzer had a limited travers range of 12 degrees. The whole vehicle had to be moved by the driver to line the gun up on a new target. The prefix letters SU stand for the Russian words Samokhodnaya Ustanovka - self-propelled unit and the numbers 152 the size of the gun. The SU-152 SPGs were issued to the newly formed Heavy Self-propelled Artillery Regiments in May 1943. The first regiment was sent to Kursk because of the Spring German offensive with only 12 vehicles, divided into three battalions of four SPGs. As soon as more SU-152s came off the production line they were sent to the front. Regiment authorised strengths in November 1943 consisted of 21 vehicles and a KV-1 tank which was used as a command vehicle. The interior of the SU-152 fighting compartment only had room for the storage of 20 large high explosive HE shells. It was not issued with armour piercing rounds. It was designed as a mobile artillery gun. The Russians found that the enormous blast from a 152mm shell had enough power to incapacitate if not destroy German tanks. It did not have to penetrate the enemies armour. There are reports of tiger tank turrets being blown off after being hit by one of these thundering shells. Quite often the German tank crew would be killed by concussion from the blast after their vehicle suffered a direct hit. Major Sankovskiy was awarded the medal and title of 'Hero of the Soviet Union' for knocking out 10 different German tanks whilst in command of a SU-152 at the battle of Kursk. Theywere given the name beast-killer (Zverboy) by their crews. The SU-152 had some disadvantages. Its armour protection was not as thick as it needed when confronting the new German tanks that started to appear from the summer of 1943. It was still vulnerable to the 88mm gun of the Tiger tank and Elefant tank destroyer and those issued to Anti-Tank battalions at ranges of around 1,000m. Even the 75mm German guns fitted to the Panther and Panzer IV tanks could penetrate its front armour at closer ranges of 500m. When used as a tank destroyer it had most success when a battalion would work together and lie in wait in a carefully concealed ambush. Eventually SU-152s were replaced by more heavily armoured ISU-152 SPGs. 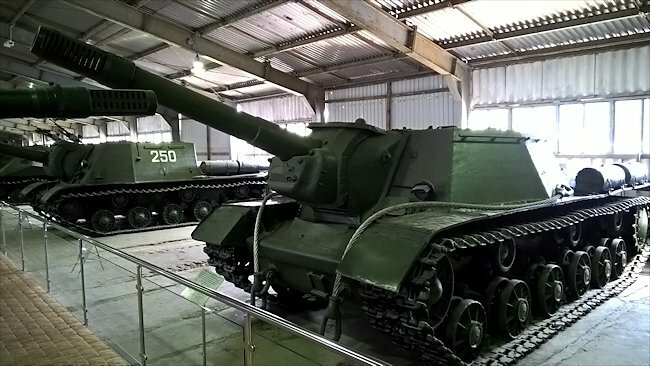 It is believed that 704 SU-152 Heavy Assault Self-Propelled Guns were produced. Where can I see more SU-152 SPGs?